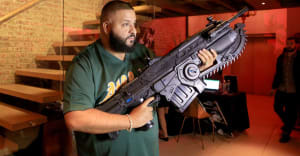 “He went into the booth and just knocked the verse out,” explains DJ Khaled. DJ Khaled's "I'm The One" is a song of the summer contender and the first Khaled single to hit No. 1. However, parts of the song came together very easily according to the man behind the tune. Speaking to Billboard in an interview you can see above, Khaled explains how Quavo's guest verse took less time to create than it takes to listen to "I'm The One." Quavo appears on the track alongside Chance The Rapper, Lil Wayne, and Justin Bieber. "Migos came through, I played it for Quavo, he was like, 'this is crazy,'" said Khaled. "The man really took five minutes, five minutes listening to the beat, and then he went into the booth and just knocked the verse out." DJ Khaled's new album Grateful will be released on June 23. It's star-studded tracklist includes contributions from Beyoncé, Jay Z, Justin Bieber, Rihanna, Future, Migos, Travis Scott, Gucci Mane, Kodak Black, and more.